What a speech last night! In case you missed it, we’re speaking of course about the State of The Union address by the 45th President of The United States of America, Donald J. Trump, and what a speech it was; summarising his first year in office, listing the achievements and ongoing plans to continue to “Make America Great Again” through the year of 2018. President Donald Trump cited the booming stock market, his substantial tax cut, as well as the slashing of many regulations, calling this creation a “New American Moment”. There’s never been a better time to realise the “American Dream”. “The state of our union is strong, because our people are strong” he said. So, without further ado, please sit back and enjoy Donald Trump’s full State of The Union address. Here’s some excerpts listed from the righteous, humble and honourable speech delivered by President Donald Trump, with an air of confidence and achievement as the underlying undertone throughout his address. There was no need to boast, and he let the facts do the talking for him. Donald Trump has created 2.4 million new jobs in a year, with rising wages for employees for the first time in decades. The African-American unemployment rate down to lowest levels in history, along with the Hispanic American unemployment rate as well. The stock market has smashed record after record in his first year, gaining 8 trillion in value with small business confidence at an all time high across America, along with 401k’s, retirement pensions, and college savings accounts going through the roof thanks to the biggest tax cuts and reforms ever seen in American history. Trump addressed his efforts to eliminate the MS-13 gang from America, a notable achievement throughout his first term, and promised that Immigration and Customs Enforcement will continue to give the resources that they require to defeat them. “Under the current broken system, a single immigrant can bring in virtually unlimited numbers of distant relatives”. Chuck Schumer’s Visa Lottery Program, which favours unskilled immigrants, will be abolished, spelling a voting disaster for the failing Democrat party, who need those people to vote for them. How about gaining votes on a merit based system instead? We think that’s much better, don’t you? Trump also lamented the good work in terminating Obama’s healthcare legacy, which has been a massive failure, and also called for a bipartisan stance on immigration and infrastructure after many Democrat cities have been almost reduced to rubble in recent decades. 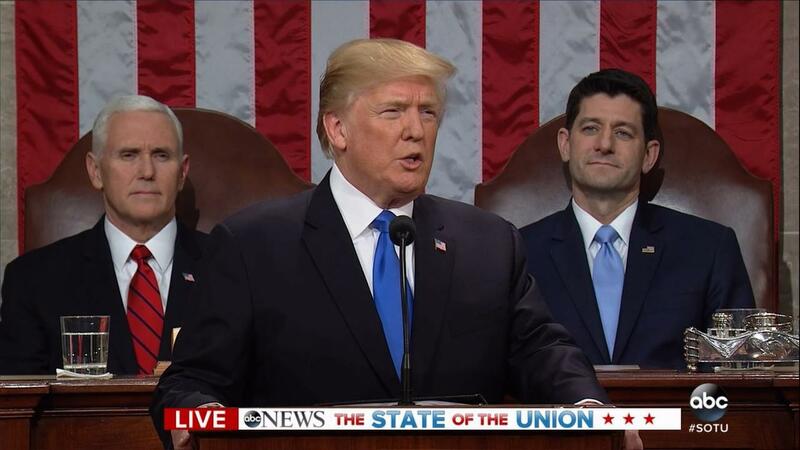 Donald Trump’s speech was Presidential, it was inspirational, and it was a testament to his administrations’ achievements in only his first year in office. As Donald Trump earlier tweeted in the week, “We are on the right track!’, and we couldn’t agree more. Let’s hope the Deep State, the Fake News Networks, and the Democrats can finally start supporting quite possibly the best President that the United States of America has ever had, or will have. Wouldn’t that be something?